SLEEP A hotel in Downtown is a must if you want buzzy restaurants, designer-label shopping and a cosmopolitan scene. Despite its location inside the iconic epicentre of Dubai — the Burj Khalifa — a delicious sense of calm pervades within the curved walls of the Armani Hotel Dubai. The hotel offers six restaurants overlooking The Dubai Fountain and a beautiful spa. The Address Downtown Dubai has one of the city’s coolest, cabana-lined infinity pools, with views over Downtown and a swim-up bar. Sun worshippers should beat a path towards Palm Jumeirah, where the beachfront hotels just keep on coming: newcomers include Sofitel, Waldorf Astoria and Anantara. Even residents of Dubai feel like they’re on holiday the moment they drive on to the trunk of this extraordinary man-made island. And Four Seasons has finally come to Dubai; a sparkling new resort recently opened on the beach within the smart residential enclave of Jumeirah 2. EAT Before the weather turns from balmy to boiling, dining alfresco is a must. Friday brunch (which has nothing to do with breakfast and everything to do with free-flowing fizz and extravagant buffets) is a Dubai institution and Traiteur at The Park Hyatt has won multiple awards for its fantastic spread. And, while Dubai may love a view from the top, the very best place for sundowners is with your feet firmly in the sand (and a drink in your hand) at the Jetty Lounge at The One&Only Royal Mirage. A little further along the beach, in Dubai Marina, enjoy the delights of chef Richard Sandoval’s modern Mexican Maya, which also boasts a late-night rooftop bar. 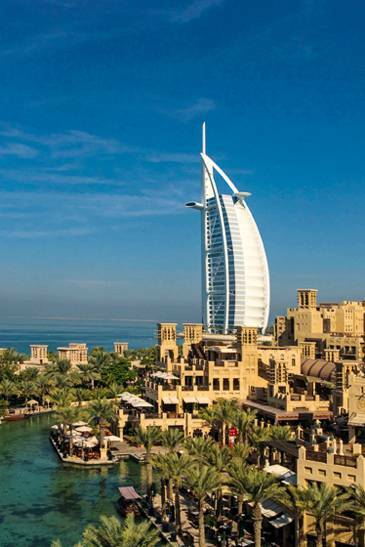 For myriad bars and restaurants all in one spot, head to Souk Madinat Jumeirah; have dinner on one of the waterways at Zheng He’s, serving modern Chinese fare, and finish with a wander around the souk’s shops, offering everything from teapots to swimwear and jewellery. For a night out in Downtown, book a table for cocktails at At.mosphere Lounge. Located on Level 122 of the Burj Khalifa, it offers extraordinary views of the emirate. Then drive along the city’s sparkly palm-tree lined boulevard to sample the French bistro fare at La Serre. For breakfast, stroll along The Beach, the newly developed area in front of Jumeirah Beach Residences, offering endless cafés, restaurants and juice bars. SHOP The Dubai Mall is the biggest in the world and, with the expansion of its Fashion Avenue currently underway, it will soon be even more gargantuan. If you’re looking for a new watch, you’re in the right spot; a staggering number of the world’s finest watchmakers have boutiques here. Discover Arabic designers at Studio 8 or lose yourself inside Level Shoe District where more than 300 shoe brands are showcased across 96,000 sq ft. Pick up gifts of chocolates from Patchi and dates from Bateel. Mall of the Emirates features the famous Ski Dubai and is where you’ll find the popular, homegrown designer havens Boutique 1 and Etoile “La Boutique”. For a more authentic shopping experience, make your way to the gold souks of Deira. Come April, the region’s fashion editors, bloggers and buyers come together for Fashion Forward, where both established and emerging designers present their newest collections. DO Fast becoming a fixture on the international circuit, Art Dubai takes places from March 18-21 with a diverse mix of 90 different galleries taking part. British Polo Day is a highlight of the expat social calendar, when a chic crowd descends on Dubai Polo & Equestrian Club. This year it’s on March 27, the day before the finale of the racing season, The Dubai World Cup. With its prize money of US$10 million, it’s the richest horserace in the world and with its wealth of thoroughbreds, huge crowds and the ruling family all in attendance, it’s an extraordinary day out. Caroline Scott is the editor of Sphere and a former resident of Dubai.